So you just connected a DisplayPort enabled monitor and your computer or laptop sound just cut off? Well, here's how to fix all your DisplayPort sound problems. The reason why the audio cut off is that DisplayPort connections have an audio stream, which means that when you connect it to a monitor or TV, it will detect it and switch the audio to that device automatically. The annoying this is that most of the time, your computer speakers / headphones / laptop audio are much better then the monitor or TV ones. Locate the "SPEAKER ICON" on your Windows task bar. It is usually at the right side of it. RIGHT CLICK on it, then select "PLAYBACK DEVICES". Note: If you can't see the speaker icon, then it's probably hidden from view. You should find a small "UP ARROW" on the right part of the task bar, CLICK ON IT. Your speaker icon should be there, so just RIGHT-CLICK on it, then select "PLAYBACK DEVICES". 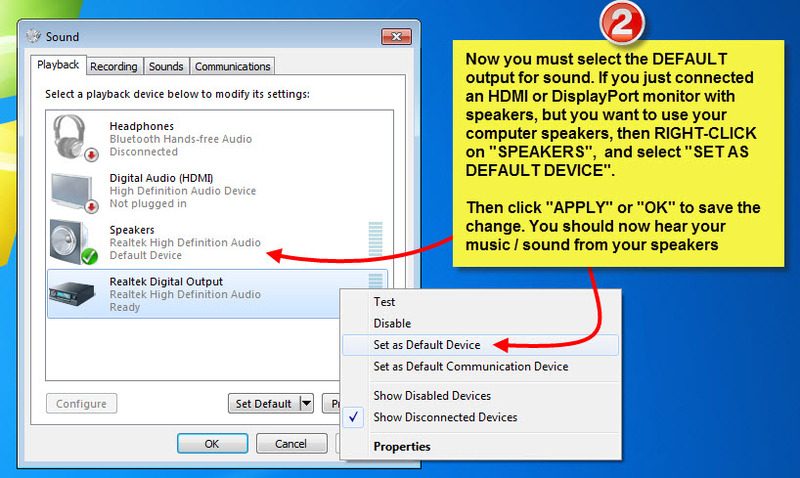 Now, you can select the DEFAULT AUDIO OUTPUT DEVICE for your computer. To do that, RIGHT-CLICK on the device you wish to use as default (in this case, "SPEAKERS"), then select "SET AS DEFAULT DEVICE". Click "OK" or "APPLY" to save your choice. You should now hear your music from your normal speakers! Note: if it doesn't work, try other sources. If you still have audio problems, check below for further troubleshooting. You accidentally pressed the "MUTE" button on your keyboard. If there is none, then check the speaker icon on the task bar: is there a red circle with a line across it? If so, it's muted. RIGHT-CLICK on it, select "OPEN VOLUME MIXER" then click the speaker icon at the bottom. There should unmute it. Windows master sound is too low. RIGHT-CLICK on the speaker icon, select "OPEN VOLUME MIXER" then raise the volume from the proper vertical selector. Computer speakers not connected to PC sound card, or headphone jack. If you built your own PC, then maybe you forgot to connect the front-of-case headphone jack to the motherboard. Refer to your manual for more details.